The serve is one of the most important shots of the game. This is the only time you will have full control of your shot. In order to be effective, the serve needs to produce an advantage for your team. As you get two serves and the second serve is relatively safe, it’s a good option to be very aggressive on the first serve. Above you can see José’s very penetrating serve. José is a Certified Padel Instructor at the Calgary Padel Club. Note how far he is from the center-line. Hold the ball with your hand facing down. The back swing starts high. It’s important here to get the elbow up to help you generate more spin. The ball is struck at waist height, with a downward acceleration of the padel and then slicing under it, creating speed and heavy under-spin that will keep the ball low over the net and also low after the bounce. Note that if you contact the ball lower than waist height, your serve may be less effective. Refer to Andres Stamile’s serve video. In padel, it can take many shots to win a point, and you may have to hit a few smashes. It’s a good idea when playing an important match to use only one ball when you are serving, instead of keeping a second ball in your pocket. When you jump for a smash, the ball can fall off your pocket, and a let must be played. You can keep the balls by the net, near the post. You are at then net in your ready position. When you see you opponent is getting ready to hit the ball, activate your feet, start making little jumps on the spot, and when your opponent contacts the ball, do the split-step and hit the volley. The volley must be deep, usually around the service line, and needs to have under-spin. Check the bounce, especially the second bounce, make sure it’s low. When you serve, always try to get to the net fast (join your partner at the net). Only about three or four steps will get you there. Don’t just blindly run up to the net hoping to find the ball on your way. As you approach the net you must watch the returner. As soon as he makes contact with the ball, slow down your progress and and get set for the volley using the split-step. This procedure makes it easier to change direction, especially if the returner hits a lob instead. Hit the volley low, deep near the service line and down the middle. You could also try to handcuff the returner by volleying deep straight at his feet. Volleying wide is sometimes risky as you can hit the side mesh, and if you make the shot you may open up the angles for your opponents to pounce on you. It’s important not to try to win the point on your first volley, just try to maintain the pressure. Concentrate on depth and the bounce after the volley. The most important bounce is the second bounce. Observe the second bounce of your volley, make sure it’s low. If you don’t go up to the net when you serve, then your opponents will, and will have the advantage in the point. They will be able to volley in the space between you and your partner. Try changing the direction and speed of your serve in order to always keep your opponent guessing. In each case, note which serve is giving you better results against each opponent, so you can use it when you need the point. Remember that while serving into the side wall can be effective, serving down the middle cuts down the angle of the return. You are looking for a return that is simpler to volley. Hit the return low. More than anything make sure you GET-IT-IN. Return to the server, as he is usually further away from the net as he is moving forward. Try to make him volley up lower than the net. Another option is to lob, which is usually very effective. Your position on the court should be behind the service line, about a meter from the line. Many players play too close to the service line, too close to where the ball usually bounces. Also too far from the back wall. The back wall is “your friend” as long as you are about an extended arm and racket length from it. It’s important to flex your legs, get down, bring the padel back early. Spreading the legs allows to get down easier. Use small steps to adjust your position. Consider a shot down the middle (or a serve down the middle) that takes the opponent away from his natural position near the corner. As he moves to the middle, now he is out of position, be prepared to hit back into his corner. He will have difficulty with this, and will most likely not be able to hit a lob. This is a good time to close in at the net. Hopefully you can put away your next shot. You can win lots of points with this tactic. Try it during your serve, and also during a point. Rush the net after you hit down the middle, and volley into his corner. Move up to the net when your opponent gives you a short ball. For example: when returning a short serve, move up to the ball, hit it on the rise, and continue up to the net. Your partner should follow you up as well. 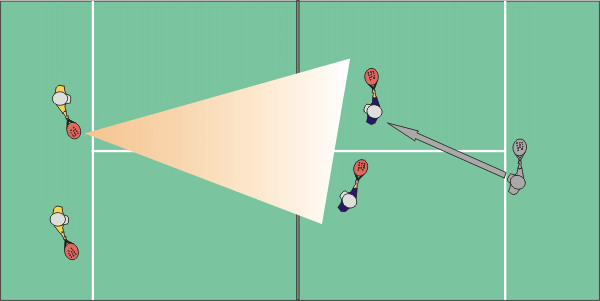 A short ball is a ball that lands close to the middle of the serving box. Sometimes you can try to volley from the service line instead of allowing the ball to bounce on the back wall. This will demand a faster reaction from your opponent at the net. When you are approaching the net and your opponent volleys the ball towards you, hit a lob over his head instead of a volley. Your opponent won’t have enough time to setup for the smash. Don’t try the drop shot on a ball that carries under-spin. It will tend to die on your padel. The drop shot is most effective against top-spin shots. This type of spin aids in the execution of your drop shot. Contact the ball with a chopping action, as if you were cutting a log. One of the safest and most effective shot is low and down the middle. This makes for a difficult volley and also may create confusion as to which of the players will hit the volley. On a low shot opponents will have to volley up over the net, which will give you a good chance at another good shot. If the ball gets passed your opponents at the net, it will stay low after it hits the back wall, making it very hard to return. Playing the ball along the sides is risky and, unless you are a very advanced player, chances are your shot will end up in the side mesh. When you are defending from the back, and your opponent’s are at the net, try to play to your opponent’s backhand. The backhand volley is more difficult to put away. 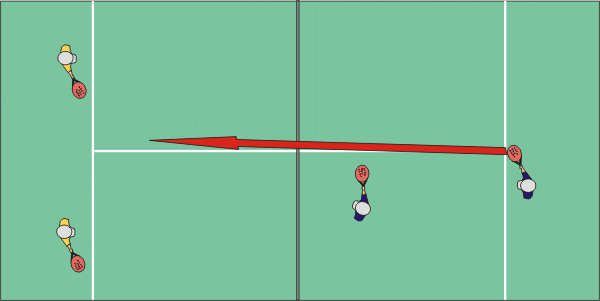 Try to get the player at the net to volley alternate sides. If you hit all your shots to his forehand, he will perfect this shot each time until he wins the point. Try a lob followed by a low shot to his feet and so on until you can get the ball over his reach, which may allow your team to transition between defense to offense. This is a defensive shot from behind the service line that serves to release the pressure and allows you to transition to a surprise attack. This is a slow, short shot just over the net with the intention to make the volley-er hit the ball from below the top of the net. 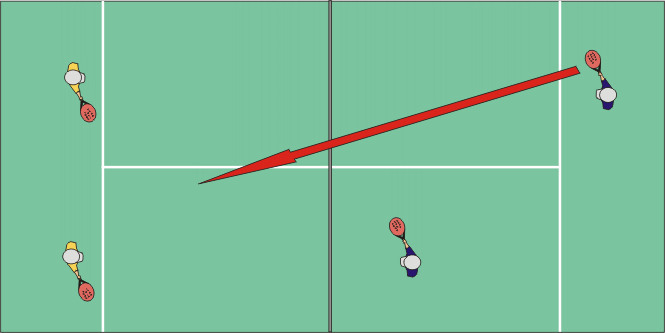 As you hit the shot, you begin to move forward and as he volleys up you’ll be in position to hit a point blank volley. Your opponent was looking down to hit the low volley, and when he looks up, bang! The Little Shot is usually directed at the feet or a wide shot, with slower pace to avoid hitting the side metallic fence. You can use a top spin, a flat shot, or under-spin. If you use top-spin, remember to watch for the possibility of a drop shot. Top spin makes it easier to hit a drop shot. Make sure you stay low to ensure that the ball stays low as well. If you push up with your legs you may lift the ball too high, and your opponent will have an easy volley. Is the nature of the game that many times when defending the ball will be at your feet. In tennis, players stand behind the baseline, so more often than not, the ball will bounce in front of them. However in padel, the player is inside the court and a lot of the shots will have to be half-volleys. It’s important to bend your knees while quickly bringing your padel straight down, without a back swing. Hit the ball off the bounce in front, pushing forward with your body. The idea is to make the ball loop over the net and come down. If your contact point is slightly behind you, or if the head of your padel is angled up, the ball will tend to sail up and your opponents will have an easier volley. When defending, it’s important to try to stay behind the service line and not to try to move forward or you’ll get caught in “no man’s land”. Stay near the back wall, your friend. Have patience, but don’t keep hitting from the back, or you’ll do a lot more running than the person at the net. You are hoping for a short ball or a ball that you can lob. Hit the lob and transition to attack by taking the net. One of the most underrated shots is the high lob. High and deep lobs force your opponents to move back, allowing your team to take the net. If their lob is short, let’s say within 6 feet from the net, then you could use the full power smash to win the point. If their lob is deep enough but not over your reach, you can use the tray-smash to keep the pressure at the net (see below: “the Tray-Smash”). If the ball is beyond your reach, then as you run back to get it, listen to your partners instructions as to what your opponents are doing. Chances are that the opponents have taken over the net. In this case the most reasonable shot is to lob them (refer to “Forehand Off The Wall”). Lobbing over your opponent’s left side is most effective, as he will need to run around his left side, which may cause him to misjudge his overhead. In addition, if he has no time to hit the overhead, he may be forced to use a backhand smash, which is usually less effective. If you’ve hit a high lob, and your opponent is reaching up to smash the ball with full power, you should cautiously but quickly move to the net allowing space in the center of the court for the smash to go through. After a long, high bounce off the back wall, you may have an easy put away at the net (see below: “Moving up on a Hard Smash”). If you can hit good volleys, look for the opportunity to follow your deep lob and come to the net. The intention here is to volley a tray-smash directed at you. Statistically, the team that takes the net wins a higher percentage of the points. Never look back at your partner hitting the lob. Keep looking forward, noticing what your opponents are doing and notifying your partner. A safety tip, always move with your partner. If he goes back to retrieve a lob don’t stay at the net or you might be a sitting duck for a smash. You will notice that the pros don’t usually come back with their partner. They stay up because the know for sure that their partner will hit a really good shot from the back. A few considerations must take place before you hit the full power smash. If you are close to the net when you hit it, use full power, try to get the ball to bounce high off the back wall and back into your side of the court. If you don’t think you can bring the ball back, or out of the park, then maybe a smash is the wrong play. If you are closer to the service line when hitting the smash, it’s more effective to hit a slower under-spin shot called “tray-smash” (also known as “bandeja”). Its purpose is to keep the pressure on your opponents and maintain your position at the net. This type of smash keeps the ball low after it bounces off the back wall. If instead you go for power, the ball may come back high off the back wall to the area of the net and could be an easy put away for your opponents. If you see your opponent winding up for a smash, you should start moving up to the net anticipating a high bounce from the back wall (see below). A smash will most likely bounce very high from the back wall into the area of the net. If you’ve just hit a lob and you see that your opponent is loading up for a full power smash, one of the players on your team should quickly start moving up towards the net in an attempt to contact the ball high as it comes back from your back wall. The other player should stay back moving towards the center to cover the back of the court, in case the smash in only a fake, and the ball is hit softly. Which player should be moving up? Generally, the player that is diagonally facing the smash, but game conditions may determine otherwise. He should move up near the side mesh to to avoid getting hit by the smash, and be prepared to run along the net after the smash to try to intersect the ball as it comes back from the wall (intersect point is along the dotted line). Note that his padel may cross over the net to hit the ball. Below you can see the tray-smash. This is different than a hard-smash or a tennis type overhead smash, where the contact point with the ball is as high as possible. The tray-smash is a common variation of the smash where the contact point with the ball is a little lower (about head height), slightly in front of you. Apply under-spin that will keep the ball low after it bounces. The finish is high, over your shoulder. If your finish is low, you’ll have a higher chance to hit the ball into the net. It should feel like when you throw a ball far away. The idea here is not to win the point outright, but to maintain the pressure and regain your position at the net. As you hit the tray smash you should be preparing to move up to the net. Your goal is not to try to end the point, but to keep the pressure on your opponents and your team’s position at the net. The safest tray-smash is directed diagonally into the opposite corner as it’s the longer shot. In addition, as the ball goes to the corner, there is a good chance that it will bounce off two walls, increasing the difficulty for the returner. Your preference should be to aim for the side wall which makes for a more complex bounce to return. Notice the height of the bounce, it will tell you how effective your tray-smash is. If the bounce is high, your contact point may be too high, or you may need to apply more under-spin to get the ball to bounce lower. Another variation of the smash is the Snake, where the ball is hit with side-spin instead. The first thing to do when you see a lob coming is to turn sideways. Best way you can ensure that you make a complete sideways turn is to point in the direction of the lights with your left hand. Pointing at the ball will not ensure you are completely turned. If you are not completely turned sideways you won’t be able to move back fast enough. You’ll see a lot of beginner players trying to just step back while still facing the opponents. Inevitably the ball goes over their head and they can never get back far enough to retrieve the ball. In addition, if they are able to hit the smash, there is a high chance it will go into the wall. Hitting the ball without turning your body sideways could cause injury to your shoulder. After you turn sideways, sidestepping back will work for short lobs, but it is not the most effective way to get to the ball when the lob is deep, around the area of the service line. Using the crossover step will get you there much faster. Move back almost facing the back wall, like running back while still keeping your eye on the ball, your padel up and your left arm up. Next set your right foot, hit your tray-smash and try to regain your position at the net. As you land from the smash, you should already be moving forward. Don’t waste time, use the correct footwork to move quickly forward. You can practice the jump as you hit the tray-smash. This procedure is commonly used on a deep lob. As for any smash, turn your body sideways, bring your padel and left arm up and push back with your left foot. Notice the footwork. The contact location for this deep lob is near the service line, so if you find that lobs are getting over your head and landing on the service line, then try adjusting your footwork. If the lob is deep, use the crossover steps as shown above. As you move back for the lob, propel yourself with your right foot with your padel in the tray position, and hit your tray-smash in the air. As you land, you are ready to move forward to the net. This is a powerful but riskier variation of the tray-smash. Its name derives from the difficult to predict snake-like trajectory the ball makes after it bounces off two walls. Due to its more aggressive nature, the snake is gaining popularity and leaving the tray-smash behind. The motion is very similar as when you throw a ball. The racket preparation is behind the head, and the ball is contacted in front of your body, between head and shoulder height with an outward motion, inflicting heavy side-spin. The finish is low, around the knee. Some players will finish higher, around the left shoulder. If the tray-smash motion is like throwing a ball, the snake is like throwing a skipping stone on the water. We’ll cover in more detail soon. Normally, you need to take care of all the shots on your side of the court. But let’s say that your partner has gone behind you to retrieve a lob that went over your head. This is the time you should move to the other side of the court, where your partner was before he went behind you. This lets your partner know that you will cover his place and that he can stay there to cover yours. Note that the player that called the switch has now moved to the other side of the court, towards the back, near his partner. That’s because the doubles players always try to work in unison. They move up and down the court, as if they were held together by a string. Also note that the opponents have now taken over the net, due to the great lob they hit. Now it’s time for the player that switched sides to inform his partner, as he retrieves the lob, where the other team players are now. If now his partner hits a lob of his own passed the players at the net, he and his partner will move forward together and take over the net. They may now face another lob, or a “forehand off the wall” (see below). Below you can see that a lob has gone over Gabor’s head, and after bouncing off the surface, it will bounce off the end wall. When the ball makes a high bounce off the end wall, since your opponents are more likely moving up to the net, you can simply chose to hit a lob, which is very effective in most cases. This is usually the best choice if the ball bounces lower than your waist. If it bounces higher than your waist, you can chose to attack your opponents at the net using the “forehand off the wall”. Ensure you are turned sideways with your padel up and your front foot in the vicinity of the service line as much as possible pointing forward. Prepare your racket early in a smash position keeping a distance of at least an arm’s length away from the ball. This will ensure that you are not crowding the ball, or you might miss the ball altogether. The contact point will be in front, as shown above. Hit the ball with under-spin low over the net in a similar way as the Tray-Smash. You can also try to hit around the outside of the ball, in a “snake” fashion (see “the knife” below). Finish your swing near your shoulder to ensure the ball stays higher than the net. The opponents that have now moved up to the net will now have a difficult volley, as they can’t have a good look at the ball when it’s about to be hit. This is a more aggressive variation of the “forehand off the Wall” where the ball is contacted in a similar way as with The Snake. It’s a faster shot than the tray-smash, with higher risk of error, hitting the around the outside of the ball, inflicting side-spin for a deadly low bounce off the opponent’s back wall (more details to be provided soon). A left handed player’s best position for your team is on the deuce-court. That’s the way to keep the strength of two forehands in the middle, where they are most valuable. For this reason, it is recommended that if your partner is left handed, your team when serving uses the AUSTRALIAN FORMATION (see below), where he will play the entire game on the deuce-court. If you don’t, when it’s your turn to serve from the deuce court, your team will be weakest in the middle, as both backhands will be there. The same happens when your partner serves from the ad-court. 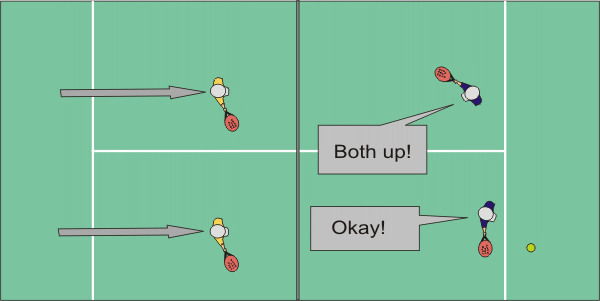 With a lefthanded partner, you’ll both have forehand overheads down the middle of the court. Usually when the ball comes from the left, your partner will take that shot. If from the right, then it’s your shot. However, don’t assume, it’s best to be in constant communication with your partner as who is going to take the shot. This formation is used by the serving team. The player not serving moves up the net on his side and stays on his side for the entire serve game. As the server now lines up near the middle, there are more effective options available for him, for example a serve down the middle could be difficult to handle. Note how after the serve was sent down the middle and as the server rushes the net, the safe angle of the return is within the reach for the volley by both players at the net. If the angle of the return is any wider, then the safety margin is reduced, and the returner’s shot could bounce into the metallic fence. 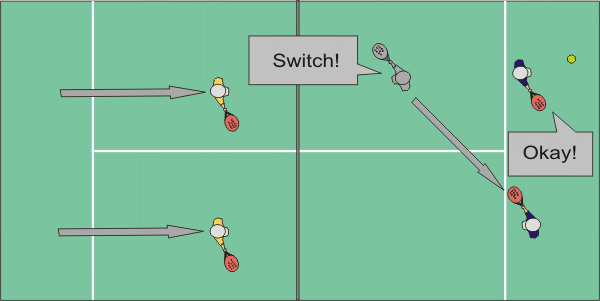 Whereas a wide serve into the wall (see above), while tricky to return if well placed, may allow space for a backhand return down the line, as the server has a longer way to get there. The most effective serve in the Australian formation is down the middle, or straight to the body. All advanced teams use this formation. The Australian formation is used is mainly because many advanced players have mastered their play for one side of the court. They are used to all the various game patterns related to the position they always play, and they are the strongest playing there. To a lesser extent, if you have played most of a game on the left side, supposedly you are more used to play on the left side, and it makes sense that you would be more effective if you stayed there for the entire game. If you and your partner have no preference as to which side you play, then the Australian formation may not provide any advantage for your team. However, it is still a good idea to practice it. To play the Australian formation, when your partner is serving, just move up to the net while staying on your side the entire time your partner is serving. Always talk to your partner and try to be positive. This includes your body language. Encourage him when he makes a good shot, and also when he fails. Don’t leave him alone to dwell over his mistakes, that will only make things worse for your team. Constant communication between the team players is essential. Whenever you are facing a shot down the middle or a lob, let your partner know as soon as possible if your are taking it or if he is. Therefore, the first one to notify the other determines who takes the shot. Just one thing: never change your mind. If you think their shot is going to hit the wall first, let your partner know he should wait to see if it will hit the wall or not. You could say: “let it bounce”. The name of the game is… PATIENCE! The average point in Padel is longer than in most other sports. When you are attacking, it’s important not to get desperate if you can’t put the ball away. You may need to hit a lot of shots to win a point. Try to keep forcing your opponents, keep your position at the net and don’t go for too much. Easy to say, but difficult to do, especially for those that played tennis and are used to hit winners. In the case of a lob, you may be salivating at the thought of smashing the ball as hard as you can, but unless you can hit it out of the park, or make it come back to your own side of the court, you’ll have a lower percentage of winning the point. Patience is also the key when defending. Don’t dream on amazing down the line passing shots. Try to keep the ball in play, lob a lot, and always try to make your opponents hit one more shot. If you see that too many of your shots are going into the net, or into the metallic fence, then it’s time to regroup and remember the name of the game! How many times you start warming up for a game and hit a few forehands when someone says “are you guys ready to start?” Of course, everyone is eager to start. Well, say you are not. When warming up for a game, make sure you have the chance to warm up all the shots in your arsenal. This way you’ll be ready to hit them correctly during the game. Start with light forehands and then add some backhands. Hit some that bounce of the back wall. At least 5 forehand and 5 backhand volleys. Pro’s normally will hit at least 20 volleys. Concentrate on form, footwork and depth. Aim for the service line. Move back closer to the service line and ask your opponent to throw you some lobs so you can practice 10 tray-smashes. If you know how to hit a snake, try a couple. Make sure you are turning your body sideways as you move back. Hit them slow, but use the correct motion. Bounce off two walls. Observe the bounce from the walls, keep as low as possible. Let your opponent know that now you are going to warm-up your hard-smash. He should move away to the center of the court so he doesn’t get hit by the smash. Hit 5 hard-smashes trying to bring the ball back to your side. Use incremental power, and full power on the last one. The direction of the smash should be in the parallel. Now your opponent can start warming up his volleys if he wants. This will be your ritual before every game you play or at least the first game you play that night. Not only will you play a better game, but you will also reduce the chance of injury and better yet, you will notice improvement as the warm up is also additional practice for your shots. Many players don’t go through this warm up ritual, and that will be another advantage for you during the game. Some may start a game without having warmed up a smash. During the game they may never get to a comfort level with that shot. Note that you don’t get to warm up your serve or your return. It would be advantageous to find an empty court before the match to warm up those shots with your partner. In order to learn to use any of these strategies and techniques, a lot of practice is required. If you are just playing games and not getting practice time, then try to work on at least one of them each time you play. For example, before the game starts, you decide you are going to practice your lobs. Each chance you have to hit a lob, you work on it to perfect it. This will help you take your game to the next level. And, don’t forget the main strategy for this game: play as much padel as you can, and have lots of FUN! If you have any more ideas on STRATEGY or TECHNIQUES, let us know at info@calgarypadel.ca, and we will try to add it to the Post. If you have any questions, we’ll be glad to answer them.